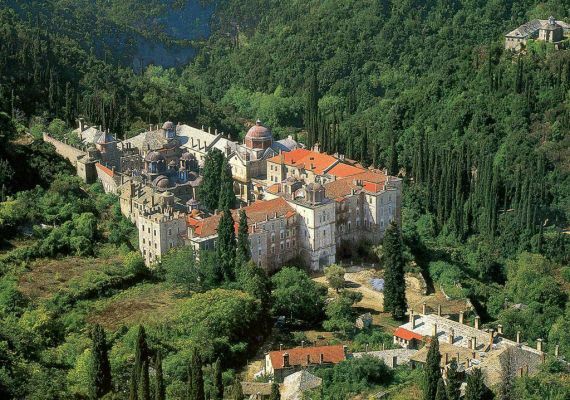 Zograf Monastery is a Bulgarian Orthodox monastery on Mount Athos. It was traditionally founded in the late 9th or early 10th century by three Bulgarians from Ohrid and is regarded as the historical Bulgarian monastery on Mount Athos, and it is traditionally inhabited by Bulgarian Orthodox monks. The monastery's name is derived from a 13th or 14th century icon of Saint George that is believed to have not been painted by a human hand and to possess wonder-working powers. The earliest written evidence of the monastery's existence dates from 980. The Zograf Monastery was plundered and burnt down by Crusaders, working under orders from the Byzantine emperor Michael VIII Palaiologos, in 1275, resulting in the death of 26 monks. These included the igumen Thomas. The reason for this attack was the opposition of the monks to the Union of Lyons, which the Emperor had supported for political reasons. Since the emperor could not attack the Greek monks without incurring the wrath of his own people, he vented his frustration on the Slavic monks. Having hanged the Protos (the elected president of Mount Athos), and having killed many monks in Vatopedi, Iveron and other monasteries, the Latins attacked Zographou. Their martyrdom is commemorated annually on October 10 (October 23 on the Gregorian Calendar) throughout the Eastern Orthodox Church. Mercenaries of the Catalan Grand Company raided the Holy Mountain for two years (1307–9), sacking many monasteries, plundering the treasures of Christendom, and terrorising the monks. Of the 300 monasteries on Athos at the beginning of the 14th century, only 35 were left by the end. But the monastery recovered quickly with the help of grants and support from the Palaeologue Emperors and the princes of the Danubian Principalities. Since 1997 Ambrosias is the Abbot of the monastery and it’s inhabited by approximately 12 monks. 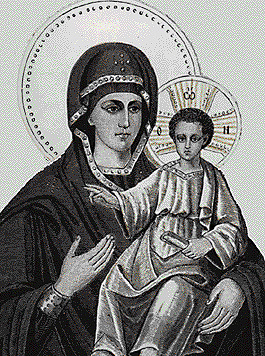 Theotokos “Akathist-Zographou” – is in the chapel built in 1764. Before being placed in the chapel, the icon was located in the cell of a monk who read Akathist to the icon daily. On one of October days 1274 the monk heard a voice, Theotokos warned him that the Romans will come over and try to persuade the monks to serve them. The monk hurried to the monastery to warn the other monks and to his surprise saw the icon already waiting for him by the monastery’s gate.